Mount Mercy University is a Catholic liberal arts university in Cedar Rapids, Iowa. The school was founded by the Sisters of Mercy in 1928. Students take a core of liberal arts courses providing a comprehensive foundation for many specific areas of study including: English, fine arts, history, mathematics, multicultural studies, natural science, philosophy, religious studies, social science and speech/drama. The university offers more than 45 undergraduate programs of study and six graduate programs. A number of these programs are available for online learning. Mount Mercy University's 40-acre campus is located in a tree-lined residential neighborhood in the heart of Cedar Rapids, Iowa (population 126,326). The Our Mother of Sorrows Grotto is listed as a historic district on the National Register of Historic Places. 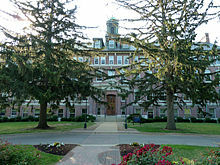 Mount Mercy University was founded as a two-year college for women in 1928 by the Sisters of Mercy of Cedar Rapids, Iowa. The sisters, whose order was founded in 1831 by Catherine McAuley in Dublin, Ireland, have been active in Cedar Rapids since 1875. The college was an outgrowth of their concerns about the education of women. In 1957, Mount Mercy became a four-year institution and awarded its first bachelor's degree in 1959. The college received accreditation as a baccalaureate institution by the North Central Association in 1960. In 1968 the Sisters of Mercy transferred their legal authority and responsibility to a self-perpetuating independent board of which three members would always be Sisters of Mercy. Mount Mercy College became coeducational in 1969. While integrating a strong liberal arts component, the college has always emphasized professional development from its early involvement, as a junior college, on business courses and teacher education. The departments of nursing, education and social work were accredited in the 1960s and 1970s as the four-year programs developed. Begun in 1997, the Adult Accelerated program, a joint Mount Mercy University/Kirkwood Community College accelerated degree completion program for working adults meets an important community workforce development need. On August 23, 2010 the institution was re-designated as a university. Mount Mercy teams are known as the Mustangs. The university is a member of the National Association of Intercollegiate Athletics (NAIA), competing in the Heart of America Athletic Conference (HAAC). Men's sports include baseball, basketball, bowling, cross country, golf, soccer, track & field, and volleyball; while women's sports include basketball, bowling, cross country, golf, soccer, softball, track & field and volleyball. Intramural activities include basketball, volleyball, golf, flag football, softball and cross country. ^ Vanessa Miller (April 30, 2015). "Mount Mercy grotto makes National Register". Cedar Rapids: The Gazette. Retrieved 2017-09-14.